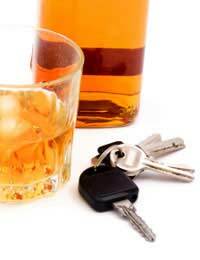 The police can stop you if they suspect you are driving under the influence of alcohol. Also, if the police suspect you are about to drive a vehicle (for instance you have your keys in your hands and are just leaving a pub) you can also be stopped and asked to take a drink-driving test. You may also be asked to take a breath test if you are involved in a road traffic accident. Being in charge of a vehicle when you are over the legal alcohol limit. Driving a vehicle whilst over the legal alcohol limit. When stopped by the police failing to give a breath test. The first test that you will take after the police have stopped you will be a breath test. You are breaking the law if you refuse to take a breath test, but if you do refuse you will be arrested and taken to a police station where a sample of your blood or urine will be taken for testing. Note that only a doctor can take a sample of your blood, and only with your consent. When you arrive at the police station two samples will be taken. The lowest reading will be used as evidence in your case. You should be given a printout of the alcohol level that has been detected for your own records. Usually the samples are just breath samples, but the police can request that you give a blood or urine sample. This may happen if you are unable to give a breath sample, as you are too drunk. Also, the police may not have a breath device or a qualified officer to operate it available. A doctor may also have informed the police that your condition may be because of drugs and not alcohol. If your alcohol tests are positive you will be told your rights and cautioned about anything you say can be used in evidence against you. The details of your offence will be recorded on your charge sheet that you will have to sign. You will be given a copy for your records. You will then be free to go and expected to appear at the court at the stated date and time on your charge sheet. A fine of up to £5,000. Between 3 and 11 points to be put on your licence. A prison sentence of up to 6 months. What are the Legal Alcohol Levels? 35 microgrammes of alcohol in a100 millilitres of your breath. 80 milligrammes of alcohol in a 100 millilitres of your blood. 107 milligrammes of alcohol in a 100 millilitres of your urine. Note that if one of the two breath tests you will take is below 39 microgrammes you will not be charged. If your breath test is between 40 and 50 microgrammes you must be offered the chance to give an alternative blood or urine specimen. However, if your breath test is over 51 microgrammes you will be automatically charged and face an appearance in court. "Note that if one of the two breath tests you will take is below 39 microgrammes you will not be charged. If your breath test is between 40 and 50 microgrammes you must be offered the chance to give an alternative blood or urine specimen. However, if your breath test is over 51 microgrammes you will be automatically charged and face an appearance in court." I was arrested for drink driving, I blew 72 and then 70 It’s my first ever offence and have a clean license, what will I get? I have just been caught drinking driving and blow 55 1st offence what would I get if I say guilty. Is it a years ban and a fine. Please see the link here, which will answer your question more fully. I have just been caught drinking driving and blow 55 1st offence what would I get if I say guilty.Is it a years ban and a fine . This statement in the article is incorrect: 'If your breath test is between 40 and 50 microgrammes you must be offered the chance to give an alternative blood or urine specimen' The requirement to provide the option to provide a blood or urine sample was abolished some time ago. It was originally there to allow for machine inaccuracy but as technology and accuracy has improved, the blood/urine option between 40 and 50 microgrammes has been removed. I blow 40 in my breath test what will happen can't afford to lose my license as I'm a lgv driver I have no points and no other conviction worried and feeling stupid. You can see the link here, which will give you a reliable estimation of what sentence you can expect to receive. The drink driving penalty calculator link here provides a reliable estimation of what you can expect to receive upon conviction of drink driving at Magistrates' Court in England and Wales. However, as the article also states, the courts do have the discretion to deviate from the guidelines where there is evidence of extreme and/or multiple mitigating or aggravating factors surrounding a particular case (e.g. a serious road traffic collision). Its done now theres not alot you can do until court.? ?I v been to court second time after blowing 3 times over in 11 years. When you go it might be worth speaki g to the duty solicitor.Where they sit you can roughly tell you what they aregoing to do. When i went in they put me in the box and low and behold of to prision i went for 2 months where as the first time i sat behind my solicitor.Its a scarey situation.When you go just be aware that you might be going home a bit later than you think.Bring someone with you.It will all depend on the day and evedence.The prision side was not as bad as i thought it would be BUT its not something that i would recommend.It was hard being away from family and not being able to sort out any issues at home but you keeppositive knowing that you will be home soon. @Sangu - see a solicitor. If you were drunk in charge of a care, it doesn't matter if it is a car park or out on the open road, it's still considered illegal to drink and drive. I blew 49 last night and wasn’t offered the chance to do a urine or blood test. Can I use this in court? I blew 141 and it's my 2nd time in 3years, will I go to prison? hello my boyfriend got pulled over and arrested for having cannabis in his system when doing an on the road side drug test he was then taken to the police station and given a bloody test this was all before the week before Christmas and we still have not head anything? is this normal how long does it usally to take to know what is happening? I blew 40 but was not offered a blood or urine sample. Im due in court next week. What could be the possible outcome, does it look like ill lose my license? Re: Breach of Court Order: What Steps to Take Next? What to expect on day 1 of jury service? Re: What Happens at an Immigration Hearing?